“Focus on what’s important.” As a team all of us have a lot to focus on, but as the year has progressed we have learned to focus hard on what is important to us. Usually, when I talk to my teammates they say one of the most important things this year that is nearest and dearest to their hearts is the members. The members that have driven us to improvement. The members that have kept us positive throughout the year. The members who have truly changed all of our lives. Although we come from different areas and distances, every one of us have realized that miles bring family closer to the heart. Whether it was calls on the way home or sending baked foods back to Trafalgar with us, our families have truly shown us what love is and we could not be more grateful. “Capture the good times.” Lindsey and Brittany are great photographers and capture so many of the good times with their cameras; however, it is those times of random laughs, life talks, and dance sessions that cannot be captured on camera that make the best of memories. Just a couple days ago, we had the first campfire of the year that began at seven o’clock and did not end until midnight. The evening was filled with s’mores, country music, star gazing, and reminiscing on the greatest of times throughout this year. Those are the times you cannot picture or replace – the times that remind you of why God put you with the friends you have. “Develop from the negatives.” Life throws curve balls at everyone including: adults, toddlers, sisters, brothers, the wealthy, the poor, the famous, and the most faithful of people. There is one thing that sets people apart from the crowd – the way they react to those curve balls. Negative times can and will happen to all of us, but will we stay knocked down and paralyzed or will we rise up and climb even taller than before we fell? This year some of our negatives may have ranged from being homesick, needing help with our car, to just needing caffeine; however, the best part of these negatives is we learned how to create these situations into some of the best times of our lives. When we are homesick we get a hug from a teammate and call our family to hear how they are doing. After some of us getting our car fixed, they would go get ice cream with a teammate to relieve the stress. And when we are tired, we get a Kickstart and jam out to music while having a sing-off with our teammate in the passenger seat. This year has made all of us grow as individuals and grow together in the good and the bad times. 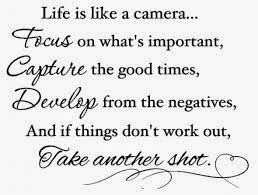 “And if things don’t work out, take another shot.” Sometimes plans do not work as they are supposed to, but that is when the best things happen and true colors shine. They say that if plans don’t go the way they should, do not change the goal but change the plan instead. During the highs and lows of this year plans have not always worked out, but I always knew I had six special people that have always had my back. I remember that when I would try to memorize a speech and would just want to quit because it was challenging, the couple teammates I was practicing with would tell me to try again…..and again….and sometimes again. It is special to have those people who believe you can do anything if you only try. That is something everyone has in common. Trust me if you try and truly try, you can succeed if you have a support system and do not give up easily. To my teammates (a.k.a my support system) thank you for not letting me settle for less, but always pushing me while showing me how much you all truly care. Our team lives by quotes and has read thousands of quotes throughout this year; however, in my eyes I believe we are creating our own quote. We are leaving a mark on this association, the members, our friends, and each other. Not only are we leaving a mark, but so many other people have left their mark on us as well. 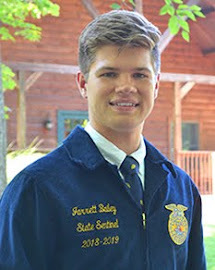 As I said earlier, members of Indiana FFA are nearest and dearest to all of our hearts and those we have come in contact with have truly impacted us in the most positive way possible. Thank you to the members, state staff, and family who have never given up on us and who have helped us capture those good times in our memory. The heart will always show you the right direction to travel if you just trust it and enjoy the ride, remembering to focus on what’s important and to capture all those good times. If you know anything about me, one thing is for sure- I LOVE music! Country, pop, contemporary Christian, and a variety of other genres! But one of my personal favorites would have to be 90’s country! Alabama, Sara Evans, Dixie Chicks, The Judds, Martina McBride, George Straight, Jo Dee Messina, Tim McGraw, the list goes on and on and on. Call me crazy but there is something about country from the 90’s that makes me smile! It’s the kind of music that you drive around town to with your windows down on a sunny summer afternoon. Most artists have songs that tell stories that their fans can connect to. Whether it is Carly Rae Jepsen singing “Call Me Maybe”, “Marry You” by Bruno Mars, Walk the Moon’s “Shut Up and Dance”, “Style” by Taylor Swift, “Mom” by Garth Brooks, “Get Back Up” by Toby Mac, or even Sara Evan’s “Born to Fly”: People relate to these songs. Music has a way of making you feel a certain way. It can determine your mood, channel your thoughts and even play an effect on your words and actions. I love small towns. This year while traveling the state, I have driven through my share of small home towns but to me, nothing can compare to the small town that I am from. A song that makes me love life and everything about coming from the small town of Hope, Indiana, is “Down Home” by Alabama. This song makes me feel proud, cheerful and even blessed. It makes me think of my high school friends, track practices spent running down the sidewalks, the water tower, eating at the Mexican restaurant right beside our town square, Friday night basketball games, support from our community, and everybody knowing everybody. Hope may be small and it may be considered a “surprising little town” but I am so fortunate to have been raised in a community such as this. Although these are lyrics to a song, they also speak a lot of truth. Coming from a town where everyone knows everyone, you would think that there would be a down fall to this, but I would like to think otherwise. In Hope, Indiana when you walk into El Jefe (our Mexican restaurant), you better expect to at least see a friend or even a neighbor and if it’s a family member, they may secretly pay for your meal before you can object otherwise. When you are struggling in a specific class and need a little extra help, you better believe that your Pre-Calc or English teacher will take time out of their schedule after school to help you until they know that you understand (My teachers are the reason I survived high school! A huge THANK YOU is due to them for their caring hearts!). If you have a flat tire, more than likely someone will pull over to help you out. It’s senior night for the basketball team, cheerleading squad and band? At least half of the town will show up to watch a good basketball game and also show their support. Have a last minute cupcake drive to raise funds for a family for Christmas- community members will go out of their way to make sure they can fit it in their schedule and help out their local FFA Chapter. A piece of farm equipment breaks down, its 8:00 p.m. and there is still at least two hours of work to finish up until this last field is complete (I say this, because let’s be honest, sometimes equipment breaks at the most inconvenient times), with a quick call to your neighbor, before you know it, with an extra pair of hands, some tools and a few prayers, you are back in the tractor finishing up that last field for the evening. I say these things because things like this happen. All of the time. The community members from my town have a heart the size of Texas and I honestly could not imagine calling the small pin point of a town on a map my home town. I have found scenarios such as these, true for most small towns. 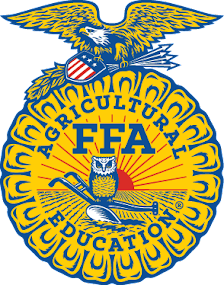 During FFA Week when I was in the Remington, Indiana area, a father of an FFA member noticed me behind him in the drive thru at McDonalds and without hesitation, he paid for my Diet Coke and fries and wished me a “Happy FFA Week!” Awesome things like this happen in small towns. 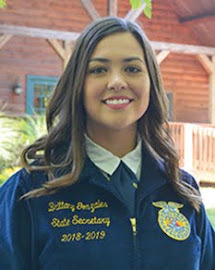 Before this year, as a member reading these blogs I always loved discovering what the State officers had been doing, learning, or seeing. It was an honor to stumble upon the articles that shared the growth that the team had experiences both personally and as a team. But the blogs that I always liked the best were the ones that provided a glimpse into the lives and the house of the State Officers. 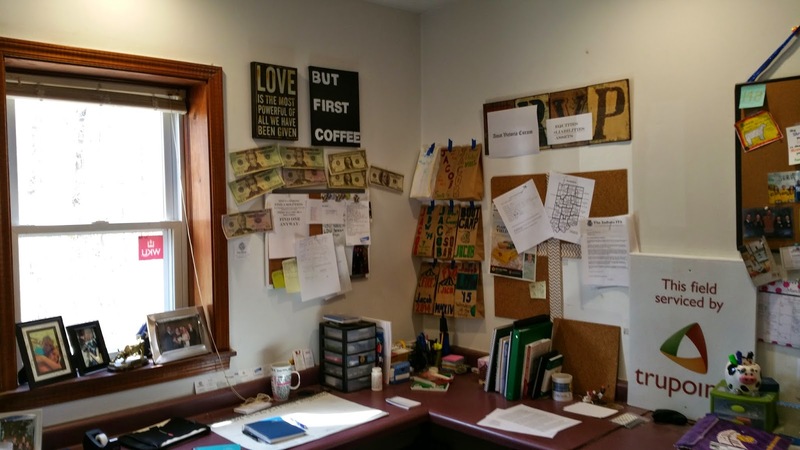 After raking through some old blogs this morning I decided that I too would provide you with a look into our office. Like Cameron said, we spend countless hours in our officer. 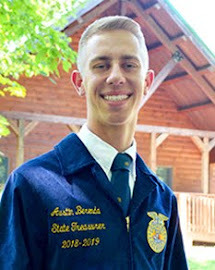 Much of this time is spend building programs, answering emails, developing curriculum, and lately we have been dabbling in the task of planning the 86th Indiana FFA State Convention. But don’t let us fool you, there have also been numerous times that we have had mid-day dance parties, late night sleepovers, and spontaneous Nerf gun fights. The office is a place that from 8:30am till 11:00pm you can always find at least one State Officer at their desks. 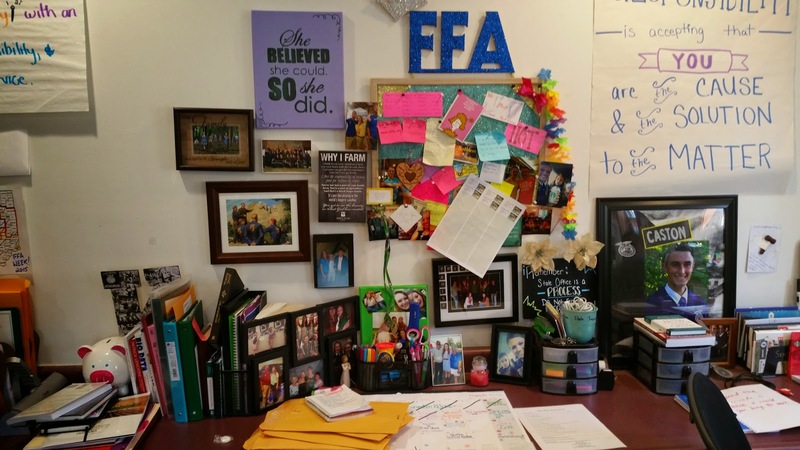 Our desks are the place to do the work for the around 10,700 members of Indiana FFA and without further ado the officer of the 2014-2015 Indiana FFA State Officer Team. Ill start with Kathleen’s desk because hers is the first desk that you see when entering our office. As you can see Kathleen has a love for anything glittery or with a quote. 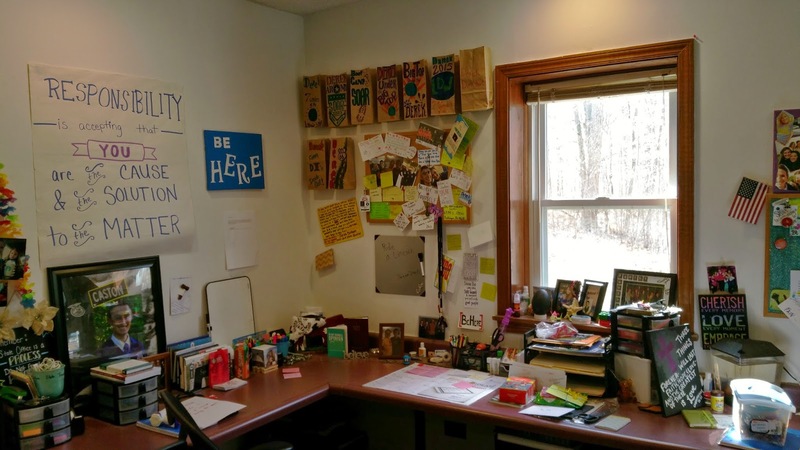 Although it may look like there is a lot on that bulletin board, ever little thing has a purpose. From the pictures reflecting on the year, to the wooden heart she received for Christmas with all of our names on it. Kathleen is organized and determined, but never ceases to let us know how much she loves us. We love you too Aunt Kathy. The next desk you see is Derek’s. If you didn’t already know this Derek is extremely organized and put together. We joke that it is kind of intimidating sitting in Derek’s chair because everything has a place. From the books on the side, to the bags on the wall, even the picture frames in the widow, each item has been strategically placed. Derek’s life motto is Be Here and you can see his constant reminders on the wall. Looking at the white boards now I am honestly impressed that they are both not completely covering in to-do list, grocery needs, or simply just movies that we want to watch. I also believe that Derek goes through the most stick notes on the team, but that is because he is continuously working on more than one task at a time. This is defiantly a desk that gets used. Beside Derek is Dakota. The Reporter has the smallest desk of all, but Dakota has found a way to make it her own. To start I’ll have to mention Bobo the goldfish in the corner that Dakota inherited from Shelby. This year Dakota sure has been fighting the learning curve on how to care for a fish, but with a little coaching she has gotten much better. 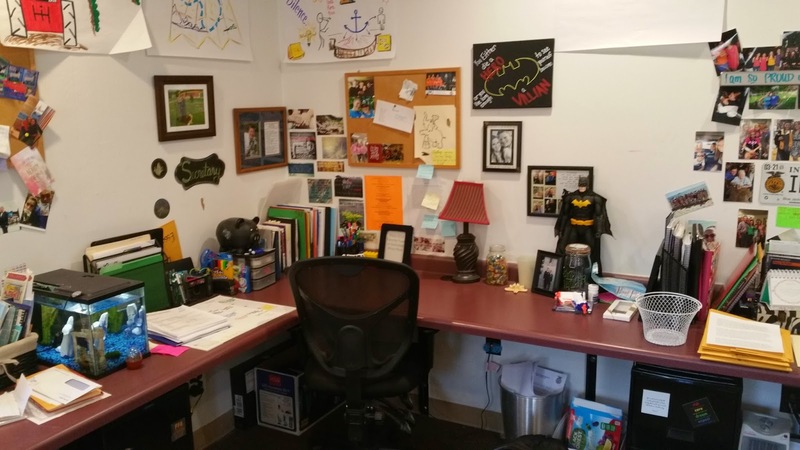 Dakota’s desk reflects her huge heart. 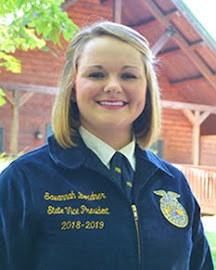 A heart for her family, her friend, her faith, our team and all of Indiana FFA. The flag represents the pride in being the Reporter. 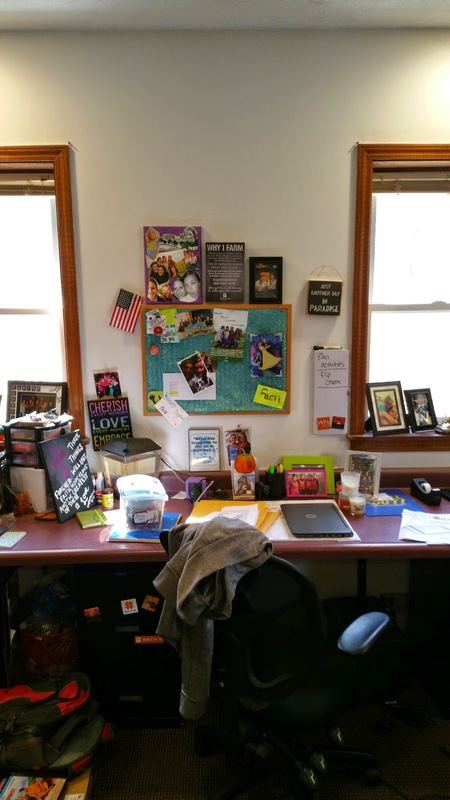 Although the desk is small, Dakota accomplishes great things from this area. Following Dakota is Jacob. Out of all the desk in the officer, Jacob’s reflects his personality the best. I am honesty impressed by the amount of decoration that he has accumulated through the year. The newest addition is the oversized $20’s and $50’s which point to Jacob future in the finical industry. On a sheets of paper you can read "AMAT VICTORIA CURAM" which is Latin for "Victory Loves Preparation." Jacob is a simple man. He doesn’t need much. Coffee, a good book and top gear pretty much describe Jacob and his desk. As you continue around the room the next desk is the NRVP’s. Sheep, bling, and a show ring, that is Lindsey. If you haven’t noticed yet, Lindsey is a loved of all things pictures. On the left she keeps her pictures of her family and friends from back on Packerton Road. It is safe to say that Lindsey receives the most mail, so it is not uncommon to see envelops piled up on her desk. When she is not at her desk Lindsey is often working on the couch rocking out to her own music. I don’t know if you have noticed it or not. But each of the guy have the corner desk. Ironic? I think it was purposely planned this way. Therefore the next desk is mine. I’m sure one first things you notice when looking at my desk is the Batman on the side. He is promptly followed by the Batman quote “You either die a Hero or live long enough to see yourself become the villain. Both of these items display my love for my favorite superhero Batman. Another item that makes my desk unique is the five gallon fish tank that divides Lindsey and I’s desks. Being an animal lover I needed something to care for this year and Dwayne is what I got. 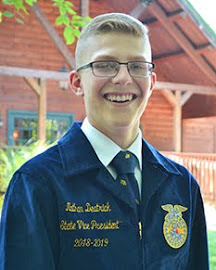 Although Dwayne is just a goldfish he too loves the FFA. Just look at all the blue and gold in his tank! Moving along, you may notice, that like Derek, everything has a specific location. All my working folders in the corner, calendar on the side, and typically my laptop resides in front of my lamp. All in all I like to say my desk tends to stay pretty organized and I enjoy being in the corner. And last and certainly not least is Miss Brittany. 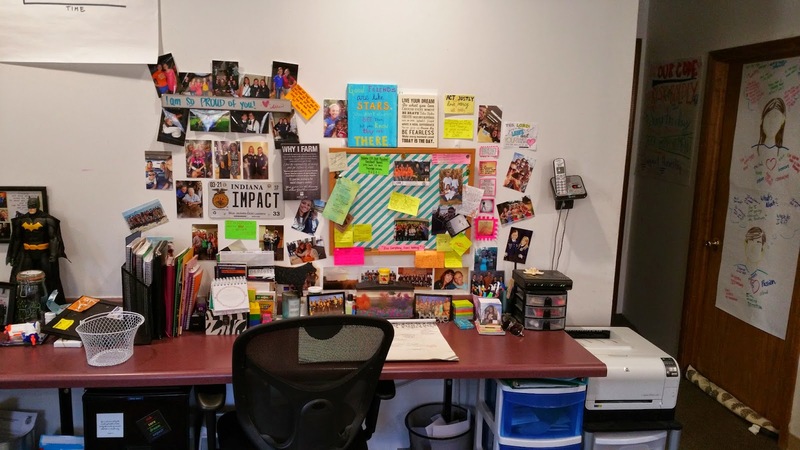 Brittany’s desk has pretty much stayed the same since about the first week when she posted up all of her pictures. 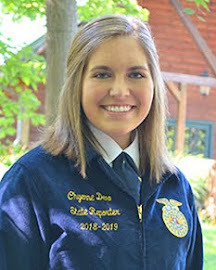 Brittany’s pictures reflect her friends and family as well as her time in the Dominican Republic and this year as a State Officer. Brittany’s desk is definatly one that gets used quite often. It’s not uncommon to find Brittany working either in her bed, or at her desk, well after everyone else has called it a night. Brittany to has a fish. Its doesn’t really have a name nor does is ever really do anything, regardless it is there in the center for all to see. From pictures to quotes, to memorabilia passed down from previous State Presidents. 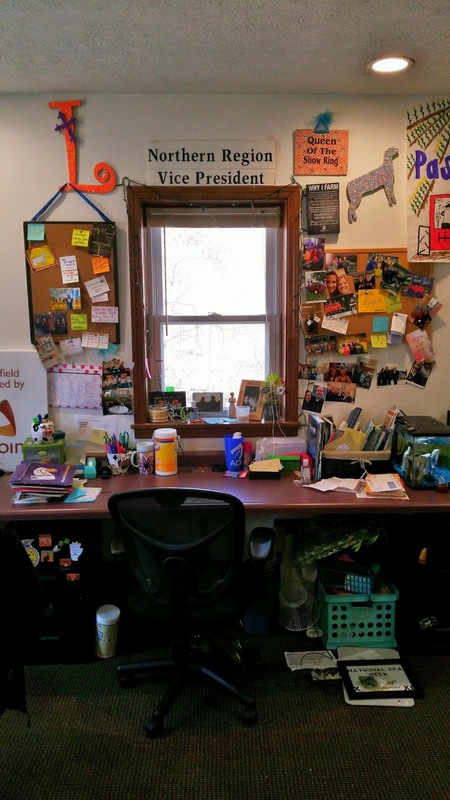 Brittany’s desk shows us all the servant leader that she is. And with that you have seen it all. That is our office. As a member I always dreamed about what it would be like to work alongside six others between these four walls. And today I am living out that dream. This year has become more than I ever could have imagined, but I wouldn’t trade a single millisecond for anything in the world. It was late, maybe 11:00 p.m. I was on the interstate, rushing through space and time at seventy-five miles per hour. The radio was off, as it often is when I drive alone. Only the engine noise and the road noise consoled me and my churning thoughts. Chief among my thoughts was the list of things I had to do when I reached my destination. I needed to write a speech; I needed to memorize that speech; I needed to write presentation curriculum; I needed to respond to emails, and I needed to be up at 4:30 the next morning to again get on the road. I was tired. It had been a long day, and there was still a lot of it left. Tomorrow would prove to be no shorter. However, despite my fatigue, I found my situation to be utter bliss. The traveling and the presenting was taxing, but I absolutely loved it. Speeding down the dark and empty interstate that night, I hoped it would never end. Tired as I was, I hoped it would never end. In German there is a word, Fernweh, that has no perfect English translation. It is sometimes described as a homesickness for somewhere else. It is that feeling that makes you want to go somewhere, anywhere. Sometimes we English speakers use the word wanderlust in its place. Laying in my bed after the conclusion of FFA week, safe and sound in the state officer house with nothing but relaxation and recuperation on the schedule, I found this fernweh eating at my conscience. Perhaps it is because I’m nineteen and am yet unburdened by “grown up responsibilities.” Perhaps it is a pathological fear of becoming sedentary, and falling into a routine. Perhaps it is merely an inborn fondness of being on my way to somewhere, to meet someone, or do something. Regardless of the cause, the symptoms are obvious. I love being on the road. This year I have had countless incredible opportunities to crisscross what seems like every road in Indiana. 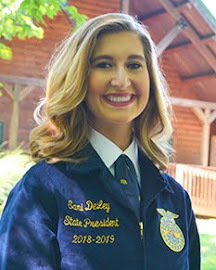 In the depths of my conscience I know that in just a few short months my journey as a state officer will end, but I can only hope that my travels will not. Here’s to us that wish never to stand still. Here’s to those of us possessed with das Fernweh.